Step #1 in Basement Remodeling - Use A Concrete Sealant! Whether your hiring a contractor or are tackling a basement renovation on your own, when it comes to basement remodeling the first rule of thumb is, do not start the project until you know the basement is dry! Water issues can cause serious damage and a ruin your investment. The spray-on application is quick and easy for basement remodeling contractors or homeowners. RadonSeal™ Penetrating Concrete Sealer is non-toxic, nonflammable, and emits no VOCs and best of all, THE SEAL IS PERMANENT! Moisture problems are the most common complaint of homeowners and most basements develop water seepage within 10 to 15 years. Also, one out of five homes have elevated radon levels. Why? 1. Concrete Is Naturally Porous (12%-18% air) - when concrete cures, surplus water escapes and creates a network of interconnected capillaries, much smaller than human hair (10-100 nm). The capillaries draw water from the ground by wicking action or let in water under hydrostatic pressure. The pores also let in water vapor and radon gas, which are pulled in by the lower air pressure and concentration indoors. 2. Concrete Is Highly Alkaline (pH 9 -11) - The alkalis disintegrate exterior waterproofing coatings - even the best membranes are guaranteed for only 5-10 years. The plastic sheet under the slab (vapor retardant) gets "eaten" by lime from the concrete. As soil and gravel settle, water and soil gases pool in the void right underneath the slab. Water migration gradually leaches out concrete and makes it more and more porous. As concrete ages, the seepage of liquid water, water vapor, and radon gas steadily increases. 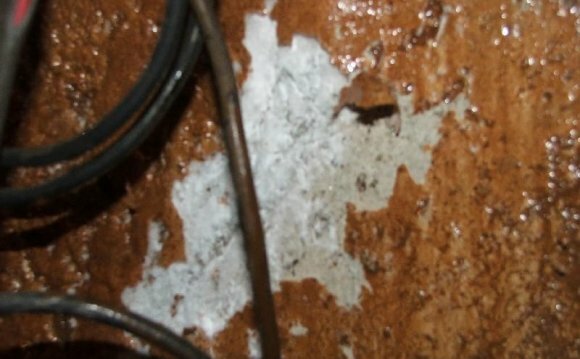 Molds and Mildew Thrive In Finished Basements! Moisture promotes molds, mildew, dust mites, and other biological air contaminants, which cause allergies, asthma, or other health problems. Ventilation spreads humidity and contaminants through the house. Molds need high humidity and organic or moist porous materials (concrete). They thrive in carpeting, upholstered furniture, drywall, wood paneling, and moist fiberglass insulation. Mildew munching on cellulose produces volatile organic compounds (e.g. aldehydes), which we detect as musty odors. Moldy furnishings have to be discarded! The key to fighting or preventing molds and mildew is removing the source of moisture. Seal your basement with RadonSeal™ against capillary water seepage and water vapor. Why do houses have crawl spaces? Can water leak through concrete?